As you all know, I’m a real cakey (and all foods) lover, so when I heard from Whatsonupnorth‘s Simon that Sheffield’s Fancie Cupcakes were giving away a special box of ‘customised’ Valentine delights, I rushed to find out when, what and HOW!!? …but as I’m such a generous and ‘sharing person’. 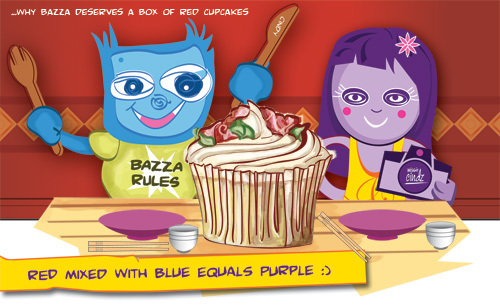 Bazza deserves a box of Red Valentine Fancie Cupcakes because we don’t get to see each other much (he’s not a SheffTowner) so he’s a very ‘sickly’ blue when he’s not with me (just look at him in the illustration above). He works incredibly hard and a box of red cupcakes would colour him up nicely to my Missie Purple self – so that next Monday (14th), we’ll be a perfectly matched up colour. Plus I know he will share the cupcakes, and that is love.